Casablanca, 28 September 2017 – Over 10 of the world’s leading financial centres today agreed to promote strategic action on green and sustainable finance, at the first-ever international meeting of financial centres, held in Casablanca. Financial centres are key locations in the economy where banking, investment and insurance markets are concentrated. This clustering of skills now needs to be focused on mobilizing the finance required to implement the Paris Agreement on climate change and the UN’s Sustainable Development Goals. A growing number of financial centres have introduced dedicated green and sustainable initiatives to seize this opportunity. This year’s G7 in Italy also identified the potential for cooperation among financial centres through a new international network. 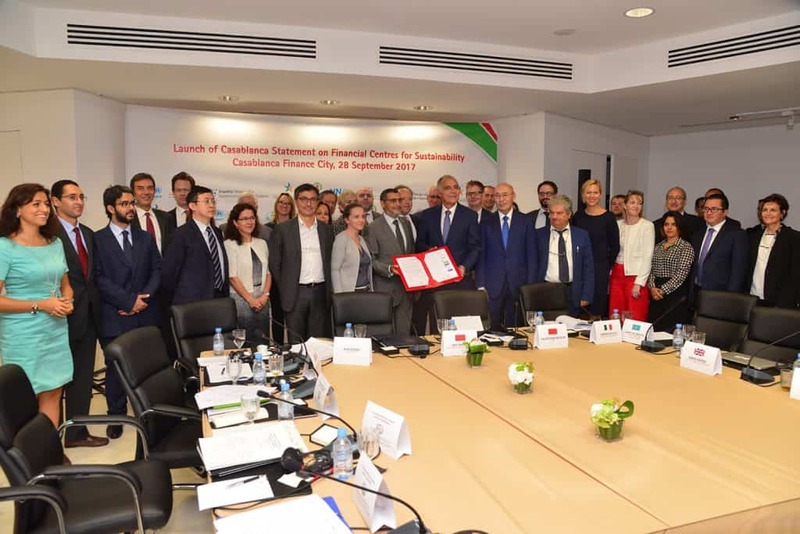 By supporting the Casablanca statement, the financial centres have agreed to launch the international network of financial centres for sustainability. This network will aim to raise awareness, promote common standards, drive innovation and build the vital skills needed for the expansion of green and sustainable finance. – Green finance is defined as finance that delivers environmental benefits in the context of sustainable development. Sustainable finance looks more broadly at environmental, social and governance (ESG) factors in both market practice and policy frameworks for banking, capital markets, investment and insurance. The investment required to bring sustainable development and climate action in developing countries amounts to US$2.5 trillion each year, with as much as 10 times that needed globally in the years to come – mainly from private sources. CFC is a pan-African financial centre established in 2010. Recognized as the leading financial center in Africa and a partner of the world’s largest international financial centres, CFC has succeeded in building a strong community of financial sector members, regional headquarters of multinational companies, service providers and holding companies. The centre offers its members an attractive proposition with great value and a premium “doing business” support that encourages the deployment of their activities in Africa. Driven by the ambition to satisfy its community, CFC is developing an african expertise in order to facilitate the development of its members in the continent.